"Merlenderl, in a game, what can be better than that?" mumbled The Walking Dead actor Michael Rooker, in a voice that betrayed a man who could easily recall a dozen things better than Survival Instinct. The brief trailer, in which no game footage was shown and two actors simply told fans to buy it, was a harsh clue that Daryl Dixon's undead adventure might not be everything it could have been. The sudden release date, coinciding with the return of the AMC television series, alongside tepid previews and visual evidence of a dated, unappealing experience, didn't exactly set the scene for a classic licensed property to rival the likes of Telltale's The Walking Dead. Life has a habit of surprising us, though. Sometimes, a game can look visually sub-par, be promoted poorly, and prepare us for a terrible experience, only to upset the playing field by being better than it has any right to be. 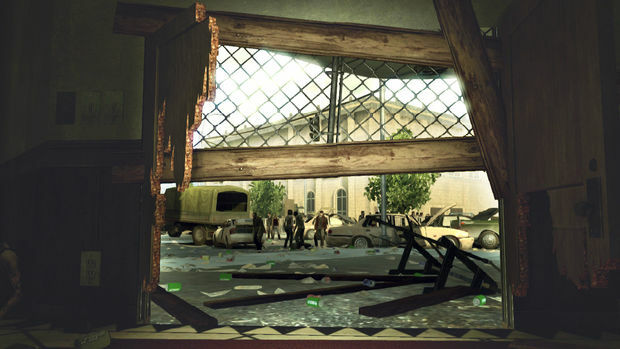 The Walking Dead: Survival Instinct, however, isn't one of those games. From the moment the game's opening menu appears, Survival Instinct sets the tone for what is to come. A still image of Daryl, rendered in blocky textures with a distinct lack of detail on his visage as if he were a child's doodle stuck on a fridge. The menu screen looks like it was cobbled together at the last minute, thrown into the game by developers in a hurry. A fitting opening gambit for a game that spends all six of its campaign's hours hammering that feeling home with brutal dedication. Attempting to act as a prequel of sorts to the AMC Walking Dead series, Survival Instinct claims to tell the story of Daryl and Merle Dixon, southern stereotypes and typically the only two characters on the show who aren't thoroughly unbearable. In reality, the story is more about how Daryl has to pick up dozens of fuel cans lying in the middle of the street. 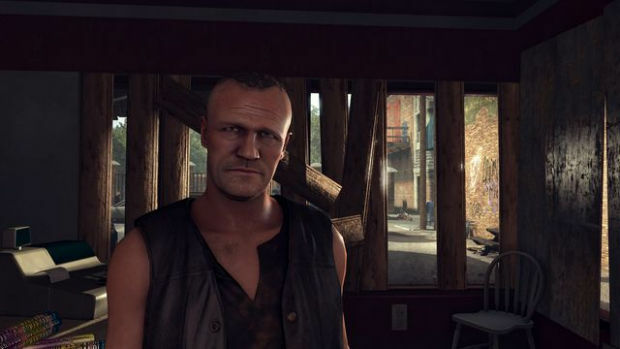 Merle is barely featured, which is a shame, because Rooker is the only one involved with the game who seems to be putting any effort in, while Norman Reedus murmurs his way through lines with all the enthusiasm of a comatose goldfish. 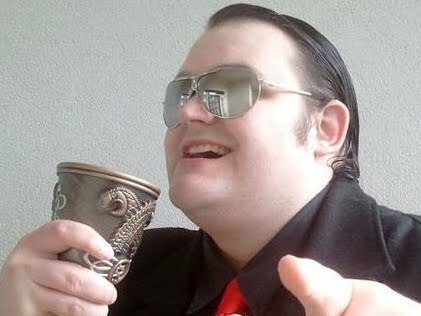 There's not really much of a story going on, and certainly nothing vital enough to prove important to fans of the show. Daryl is looking for Merle. Daryl finds Merle. Daryl loses Merle. Daryle finds Merle again. Oh, and zombies wander around in between events. Anybody looking for intriguing lore or fascinating backstory events will be disappointed -- though I'd be surprised if anybody expected anything in the first place. Played from a first-person perspective, Survival Instinct admittedly tries to have some good ideas, all of which suffer from a lack of follow-through. In each mission, Daryl must find weapons, encounter survivors, gather fuel, and locate food. 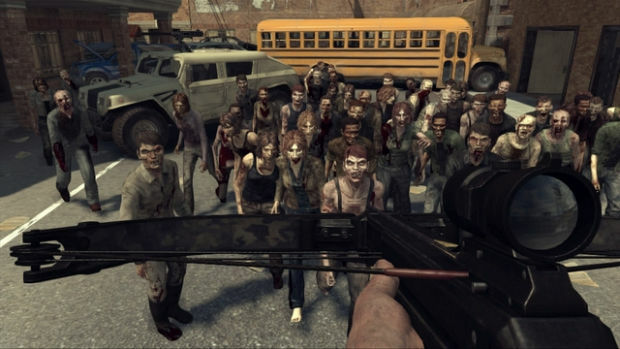 Ammo, naturally, is scarce, while guns attract huge hordes of walkers. The general idea is that Daryl makes his way quietly through each relatively small mission area, picking off the undead, completing objectives, and acquiring precious resources to continue his journey. It's a solid enough premise, but so vapid in practice, a straightforward and generic shooter may as well have sufficed. By far the most depressingly hilarious waste of potential is to be found with the survivors. During the course of the game, Daryl may encounter fellow travelers and recruit them into his group. At the beginning of missions, these survivors can be equipped with gear and sent into the area to scavenge for ammo, food, or fuel, though there's a risk they may never come back. It's a solid idea, but these survivors exist as nothing more than glorified retrieval dogs. There's no narrative reason for keeping them around, and if your car runs out of room (vehicles can only take so many), you will have to dismiss somebody -- a process as simple as choosing a victim, selecting to eject them, and moving on. The characters will go without protest, or even a single line of dialog. For a property that's always put human drama first, the wholesale trade of these non-entities is at least amusing in its irony. Although stealth is heavily emphasized, and it's suggested walkers locate you by smell, Daryl can happily walk around the environment without attracting too much attention. Not even needing to sneak, players could sprint up to a zombie and one-hit kill it with an execution animation, provided it's got its back turned. Should a walker be fought head-on, one merely needs to stab it three times. Each time a walker is stabbed, it will stumble, then roar in the player's face just long enough for the next thrust of the weapon. Each face-to-face encounter feels like a scripted wrestling match, the opponent waiting for the next staged punch. Although there is a very limited number of inventory slots, the player can never drop Daryl's knife, even when better melee weapons come along to render it obsolete. There is a single reason for this -- there's a handful of execution animations, and they all involve the knife. The knife has to stay in the inventory to justify it, no matter how silly it might be for Daryl to put his axe away and yank out a knife every single time he stealth-kills something. It becomes all the more egregious when you've run out of slots, have all manner of useful guns and ammo in your inventory, but can't drop the useless knife in favor of something superior. While generally easy, the game exploits its own shoddy mechanics to contrive a sense of challenge. Individual zombies are simple to put down, but Daryl has pretty much no defense against multiple walkers, whose comical, limp-wristed swipes can do considerable damage in quick succession. There is no efficient way to fight multiple enemies at once, as shoving them back or swinging a weapon rarely hits more than one opponent at any given time. If fighting two or more enemies, it's basically a given that you'll take damage for daring to attack. Not too much of an issue, given the abundance of health items, but it nonetheless feels cheap, and while ZombiU used a similar structure to make battles genuinely scary, the combat is so sloppy and silly looking in Survival Instinct it just comes off as miserable. Even cheaper are the zombie respawn rates. The undead reappear in areas constantly, no matter how many times Daryl clears them out, and these appearances can be instant. It seems these particular monsters are related to SCP-173, given their tendency to manifest from nowhere in the blink of an eye. 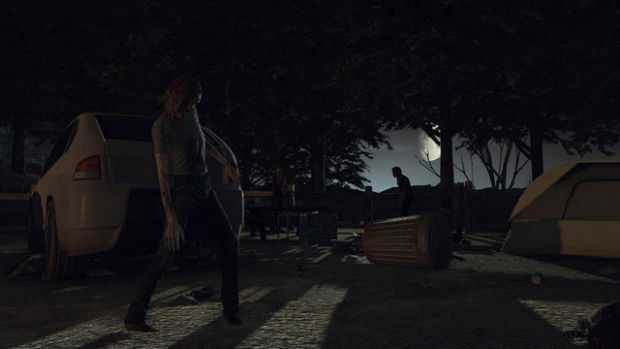 It's not uncommon to be blindsided by a walker that literally wasn't there two seconds before, or for the player to walk forward, turn around, and suddenly see several zombies in a spot that was totally empty. It is through broken elements like this that Survival Instinct falsifies any sense of danger in a game where one would otherwise feel sorry for the gurgling, ineffectual, slow-even-by-zombie-standards opposition. This is to say nothing of the laughable A.I. As well as standing ready to absorb attacks, ghouls frequently get stuck on scenery or attempt to walk through gaps too small for them. If surrounded by a large amount of zombies, it's usually easy to hop onto a table or vehicle and just cut their heads off while they crowd around, arms outstretched, like mournful orphans asking for more porridge. Even when no elevation is in sight, one can escape a crowd by letting them initiate a grapple attack, one by one. When grappling, players get to one-hit-kill a zombie with a simple quick-time event, and can power out of a large crowd by getting into this grapple over and over again while the surrounding creatures stand helplessly in line for their turn. Although there are firearms, as noted, using them is too much trouble for the zombies they attract. Firearms feel basic to the point where they could have appeared in any number of mediocre games from the past ten years, and ammo is so scarce I found myself constantly discarding guns in exchange for more health pickups or melee weapons. Late in the campaign, Daryl gets access to his iconic crossbow, which allows silent kills and retrievable bolts, but is a pain to use, and looks goofy due to what appear to be unfinished firing animations. Between missions, players get to select their next destination, and need enough gas to get there. Should the fuel run out, a new mission appears in which more must be collected. That's not the only interruption, either. At several points between mission locations, the car may break down and require a part to be scavenged, or an area containing extra supplies could be discovered. While this adds a potential element of dynamism to the adventure, the end result is mostly just annoying, as having to stop every so often to wander around the same limited pool of locations is tiring. It's also incredibly predictable, as you always know when they're coming -- if you hear dialog spoken during the transition from mission to mission, you won't need to stop. If you don't, you will. The choose-your-own-adventure structure is at least a nice idea, especially when you get to choose how you drive from A to B (taking different routes will change your fuel consumption and the likelihood of a breakdown), but it's rudimentary and lacking in anything more compelling than selecting from a basic menu. As you may have guessed already, the game is a graphical mess. Several animations look like placeholders, everything's jaggy and lacking in detail, while the physics make very little sense, with objects and limbs flying in wacky directions at the slightest provocation. Even worse is the sound, however, which adheres to no known physical logic. 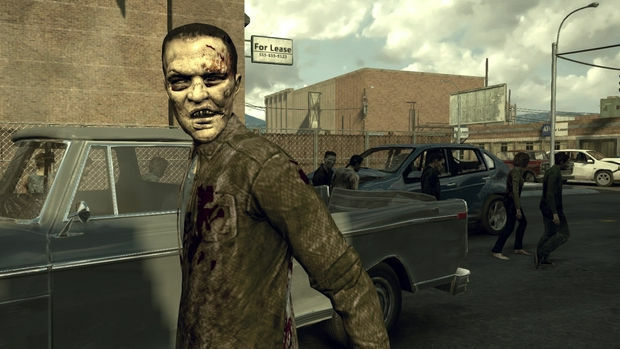 Regularly, zombies that are yards away make noises that sound like they're inches behind one's neck, and threatening screams can be heard from directions where no enemies are present. Relying on sound to get any sense of where danger lies soon turns out to be a fool's tactic. For Christ's sake, the game's opening cinematic has visible Windows cursors hovering in the corner! The lack of attention to quality is so self-evident, a review can do little to damn a game that so blatantly condemns itself. There's not much else to say about The Walking Dead: Survival Instinct because there's not much of a game there. The campaign is insultingly brief and, unless you were unlucky enough to pre-order it, there are no other modes. Gameplay is embryonic at best, nonsensical at worst, and the whole thing is ugly as sin. Although the whole thing starts off almost bad enough to be funny, the parade of genuinely promising ideas that soon turn out unfinished (or barely started) transforms a potential comedy into a tragedy of lost potential. It's easy to believe Terminal Reality had the skeleton in place for a unique and enthralling take on the Walking Dead franchise, but with a deadline looming, added absolutely nothing to the bones and tossed out something woefully undercooked. Survival Instinct clearly isn't finished, and has no business expecting money from any paying customer. It's the kind of hurried, jury-rigged game that risks dealing damage to a property -- an especially sour note considering all the excellent work achieved by Telltale's The Walking Dead. By contrast to 2012's adventure game, Survival Instinct cashes in all the property's goodwill to churn out a botched, incomplete, hideous little waste of time and energy. Merlenderl, in a game. What can be better? Most things, it turns out. Most things.